This program is open to the public. Join one of two classes with incredible faculty members! Pardes Institute of Jewish Studies Rabba Yaffa Epstein The Power of Love - What the Commandments to Love can Teach us About how to Wield Power in 2019 This session will explore the three mitzvot (commandments) to love that are found in the Torah - and what each one can teach us about both Love and Power and the relationship between those two attributes. What if a disguise is the only way to get the communication you need from your rabbi-husband? What happens when the ruse is discovered? We will study aggadot around the theme of mistaken identity between spouses, with an eye toward their messages about relationships and deception. Hadar Institute Rabbi Tali Adler The First Shabbat While the Torah never tells us that Adam HaRishon observed shabbat, the midrash imagines shabbat as a key part of Adam's story. We will read a midrash about Adam's first shabbat and explore what it teaches us about sin, forgiveness, and vulnerability. Maharat Rabbi Jeffrey Fox, Rosh HaYeshiva Halakha as Goalposts - Making Decisions in a Messy world We will look at two different approaches to the status of the fetus in Halakha which lead to two very different psakim on abortion. This debate will serve as a model for how we might think about deep debates within the Halakhik system. At 8:30 pm, join us after your learning for a special singing session with Rising Song Fellow and current Yeshivat Hadar Fellow, Anat Hochberg. Jewish Theological Seminary Dr. Benjamin Sommer The Torah's Laws of Pesah, or, Where Does Rabbinic Judaism Begin? We will take a close look at passages with laws concerning Passover from Exodus and Deuteronomy, highlighting the ways that the Torah suggests that the Jewish law was, from the very beginnings, an evolving tradition. Join us for another season of the Community Beit Midrash! 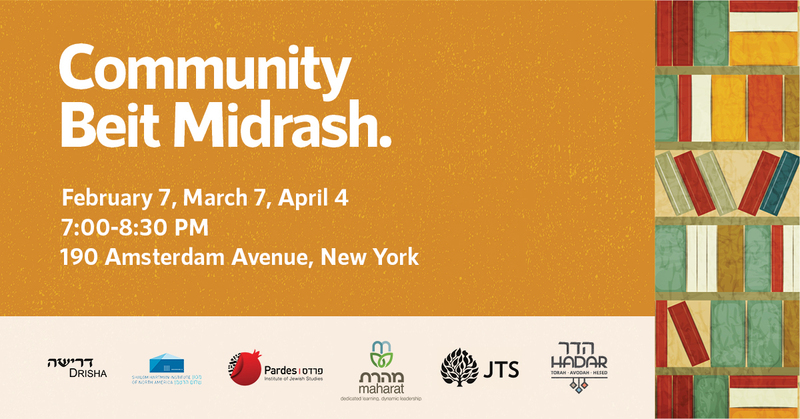 The Community Beit Midrash is a unique opportunity to grow in Torah learning and deep conversation with the students and faculty of various institutions of Jewish Learning in NYC. Each night of learning will feature learning with faculty from one of the partner organizations. 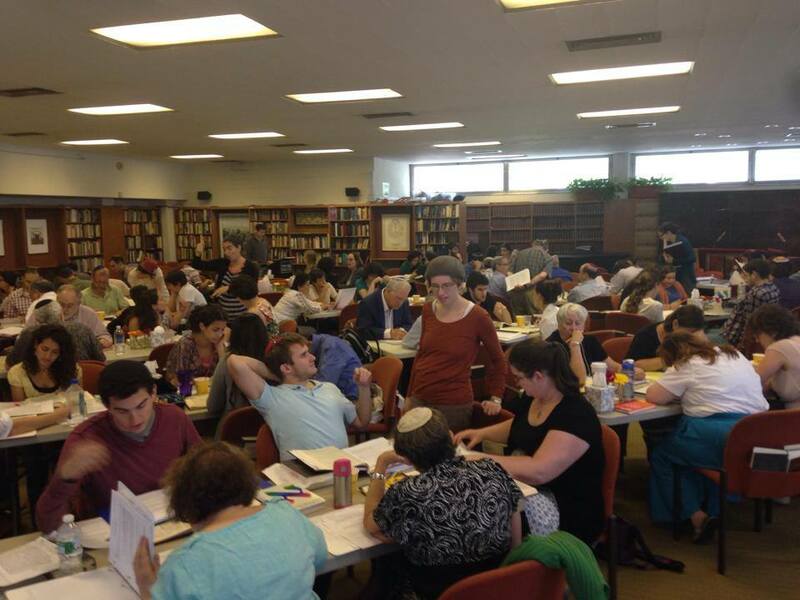 The Hadar Beit Midrash is also open for havruta-paired learning on Tuesday nights. Hadar is grateful to be collaborating with Yeshivat Maharat, Drisha Institute for Jewish Education, Pardes Institute of Jewish Studies, the Shalom Hartman Institute and the Jewish Theological Seminary. Shani Gross - "The Sexual & The Sacred"
By examining Biblical and Talmudic texts, we will explore the degree to which our tradition enables us to tap into the spiritual through the sexual. Can human sexuality be a tool to access the divine? We will investigate this question as we study the relationship between ritual, sacred objects, and sexuality - how are these categories kept distinct, when tradition blurs the lines, and possible implications for our own lives. At the end of every year, Americans are bombarded by charitable solicitations from multiple worthy organizations, and it can be hard to figure out whether to give to the local homeless shelter or the international distribution of malaria nets. Classic Jewish texts have long struggled with the dilemma of proximity and need, and we'll try to bring their wisdom to bear on a sometimes fraught conversation. In Bereshit 1:16, God creates the two "great lights" but then immediately dubs the moon the "lesser light." We will explore a family of Rabbinic readings that understand the moon to have been diminished from its initial state, as well as the metaphorical life those midrashim took on in the middle ages and today. Dr. Herzberg will lead us in a close reading of Exodus 12 and 13, along with many traditional commentaries, focusing on the verses related to the observance of mitzvot. Through an interactive discussion, we will explore some of the various approaches to why we observe mitzvot, and reflect on their implications for how we observe mitzvot today. In this interactive workshop, we will experiment with applying bibliodrama techniques to study of rabbinic aggadic and halakhic texts. Open to those with or without experience with bibliodrama. We will explore the rabbinic discussion of commandments that are performed with the aid of a sin—mitzvah haba'ah ba'aveirah. Are good deeds negated by evil means? Must we look at the full genealogy of an action in order to determine its worthiness? We will endeavor to answer these questions from classical texts and to apply our insights to contemporary questions. Join our great line-up of teachers for another round of learning together! Esther is first introduced as a passive figure, obedient to the men around her and asking for nothing of her own. In the course of the Book of Esther, Queen Esther finds her voice, takes charge of her destiny, and saves her people from annihilation. We will trace the development of Esther's character through biblical verses and rabbinic midrash. After viewing an inspirational clip from Rev. Martin Luther King Jr.’s famous speech in Washington, D.C, we will study the revolutionary ideas of social equality in the Hebrew Bible, some of which are still revolutionary today. What if beef could be produced on a large scale without causing animal suffering and environmental damage? What if such cultured (or clean) meat could be more healthful to consume, and more efficient to produce? Could such a product be considered kosher? Would it even be considered meat? We will consider a series of important questions and primary texts that can be the basis for an answer. This shiur is based on my responsum of the same title which was approved by the Committee on Jewish Law and Standards in November, 2017. The First Amendment to the United States Constitution, ratified and adopted in 1791, promised that "Congress shall make no law respecting an establishment of religion or prohibiting the free exercise thereof." But the reality for Jews living in a Christian country was often more complex than that. Over the next 227 years, American Jews prodded and nudged federal and state legislatures and courts to ensure that America lived up to the promise of the First Amendment. The fascinating story of American Jewish efforts to shape the American public sphere into one that was truly inclusive of different faiths has much to teach us about what religious equality truly means. The Talmud tells us that not only does God hear and receive prayer, but He also prays Himself. What does it mean to say that God prays? What can God's prayers teach us about our own and who we are as beings who pray? Come prepare for Hanukah with the Community Beit Midrash! R. Aviva Richman (Hadar) - Who Needs Our Light? The mitzvah of lighting Hanukkah candles is one of the most beautiful and pervasive, yet the midrash asks why we bother lighting at all. Through the sharp eyes of midrash and the creative interpretations of hasidut and modern thinkers, we will confront a fundamental doubt - that our eight little lights, our work in the world, may seem futile - and we will explore the possibilities of what it means to keep lighting in the face of darkness. Hanukkah commemorates the Jewish victory over the Seleucid Greek empire. The miraculous military victory is sometimes downplayed for the more spiritual miracle of the cruse of oil. Rebbi Shimon ha-Tzadik had his own encounter with the Greek empire when he "defeated" Alexander the Great. Come and learn about the hidden light of Hanukah. Judaism asks us to take on many obligations, and to make these obligations a part of our daily life. But, at times these practices and behaviours can start to feel rote, and unfulfilling. How do we deal with this phenomenon? And what can the holiday of Hanukkah teach us about shaking things up? We'll look at several pieces from the Talmud, its commentaries, as well as the Hassidic masters. What does it mean for Hanukkah to be the only major holiday invented in the post-biblical era? Through Chassidic sources, we will explore Hanukkah’s message regarding novelty and creativity in our Torah and in our lives. The first time the Shofar is mentioned in the Torah is in connection with the giving of the Torah. But - what is the connection between the Shofar, and the Covenantal moment of Sinai? And what can the Shofar teach us about our own relationship to Torah? This session will explore these questions, and attempt to understand how we bring our full selves to both repentance, and Torah study. The season of the High Holidays contains both climactic moments (Rosh Hashana and Yom Kippur) and in-between times (the Aseret Yemei Teshuva). What is the meaning and the message of this rhythm? How might we harness the unique energies of both kinds of time in doing the work of teshuvah? Rav Nachman of Breslov famously said that the goal of Torah study is to transform our study into prayer. The ancient liturgical poets, though, strove to make our prayers a form of Torah study by interlacing the blessings with poems that recount biblical narratives. How do the piyyutim (liturgical poems) of Yom Kippur reflect the essential nature of the day? How can these prayers help us arrive at a deeper understanding of ourselves? Vidui is an essential - according to Rambam, the essential - element of the teshuvah process. We will examine its transformative power drawing on rabbinic wisdom and insights from psychology and twelve step programs. In particular we will look at its dual role of challenging and comforting us. Come prepare for Passover by attending our final Community Beit Midrash of the semester! The Haggadah is filled with poems that we sing on Seder night; but how well do we understand these poems? Is there something more to them than cute rhymes and familiar words? In this class we will spend time examining the literary history and connections of Dayenu, with an eye toward mining for deeper layers of meaning. Tuesday, March 7, 2017 at Drisha. What transpired between father and son during their 3-day journey toward the Akeda? Why did Queen Esther have such a short guest list for her parties? The Bible contains lacunae of all kinds: missing pieces of plot lines, missing words and letters. We will explore ways in which the text's silences are not merely problems to be solved, but are artful agents in uncovering greater meaning in the text. Elli Cohn (JTS) - Hanukkah: The Festival of...Booths? R. Yaffa Epstein (Pardes) - Return, Repent, Renew - What does Teshuva Really Mean? R. Jeff Fox (Yeshivat Maharat) - Living in a Jewish World without Prophecy: Blessing or Curse? Co-Sponsored by Hadar, Yeshivat Chovevei Torah Rabbinical School, The Pardes Institute of Jewish Studies, Yeshivat Maharat, and The Jewish Theological Seminary with support of the Wexner Foundation Graduate Alumni Collaboration Grant.